This is a project that I know many people have been following. The aim of the project — which has some Measure R funding — is to improve transit on Van Nuys Boulevard and San Fernando Road between Ventura Boulevard and the Sylmar/San Fernando Road Metrolink station. Here is the project’s web page on metro.net — which has tons of great info — and here is a Source post from last October looking at project. Among the alternatives being studied: the legally-required no build option, road and traffic signal improvements, light rail, bus rapid transit and a tram, a type of train easy to board from street level. Meetings to be held at locations along the corridor on November 6, 12 & 13. The Los Angeles County Metropolitan Transportation Authority (Metro) will host a series of informational meetings beginning November 6, 2014 to update the community on the status of the East San Fernando Valley Transit Corridor Project. The East San Fernando Valley Transit Corridor project, a Measure R funded transportation project, will add a new public transit system along Van Nuys Boulevard and San Fernando Road in the east San Fernando Valley. Transit alternatives being considered for the line include: Bus Rapid Transit and Light Rail Transit in addition to the required No Build and Transportation Systems Management options. Wednesday, November 12, 4:30 – 6 p.m., Marvin Braude Constituent Service Center, 6262 Van Nuys Blvd., Room 1A, Van Nuys, CA 91401. This meeting will be available via live-stream and on-demand at http://ustream.tv/channel/eastSFV. Thursday, November 13, 2013, 6 – 7:30 p.m., Pacoima Neighborhood City Hall, 13520 Van Nuys Blvd., Pacoima, CA 91331. Special accommodations are available to the public at Metro-sponsored events. All requests for reasonable accomodations must be made three working days (72) hours in advance of the scheduled meeting date. Please call (818) 276-3233 or the California Relay Service at 711. Spanish language interpretation will be available at all meetings. The East San Fernando Valley Transit Corridor project is currently in the Draft Environmental Impact Statement/Report (EIS/R) stage of planning. Public meetings were held last year to begin the process and to provide stakeholders the opportunity to provide input on the options originally proposed through the Alternatives Analysis (AA) process. As a result of comments received and additional technical analysis, the alternatives were refined to better meet the transit needs of those travelling in the East San Fernando Valley. The project’s Draft EIS/R is expected to be completed in 2015 and will be made available for public review. Following a Public Comment Period, the Metro Board of Directors will be asked to select the Locally Preferred Alternative (LPA) for the project and authorize completion of the Final EIS/EIR. The Final EIS/R is anticipated to be completed in 2016. $170.1 million of funding for the project has been identified in Metro’s 2009 Long Range Transportation Plan (LRTP). A portion comes from Measure R, the ½ cent sale tax approved by Los Angeles County voters in 2008. When finished, the project will run approximately 9.2 miles north-south along Van Nuys Boulevard and San Fernando Road through the communities of Van Nuys, Panorama City, Arleta, Pacoima and the City of San Fernando. This corridor is currently the seventh busiest bus corridor in the entire Metro system with more than 24,800 weekday bus boardings and in the San Fernando Valley is second only to the Metro Orange Line. For questions, please call (818) 726-3233 or email eastsfvtransit@metro.net. I hope Metro will go for the LRT option, or perhaps a tram in exclusive ROW easily upgradable to LRT standards when the Sepulveda Pass transit corridor is developed. A train line under the pass would be transformative for transit in LA – our counterpart to the Transbay Tube. The ESFV corridor needs to be built with future compatibility with the Pass in mind. There is only one choice. A heavy rail line from San Fernando through Van Nuys, Studio City, Westwood or Century City, Culver City, Westchester and LAX. This project could turn out to have some of the most significant changes to any major street in Los Angeles. If BRT or rail is chosen, the on-street parking will disappear where the train or bus runs down the middle of the street and motor vehicle travel lanes will be reduced. There will also be bike lanes installed. The Orange Line has clearly shown what a significant increase in the level of service can do for ridership. This is not a route that would have normally been chosen for a major transit line. It mainly travels where there is single family housing, low transit dependency areas and a large section of it where the Sepulveda dam and Balboa park area are located has few residents or businesses nearby. Yet only the Wilshire Blvd Rapid bus route is a busier bus line. A BRT or rail installation along Van Nuys Blvd would bring a significant jump in ridership. Van Nuys Blvd is the seventh busiest bus corridor in the Metro system and a upgrade to a BRT system similar to the Orange Line would significantly increase the passenger boarding’s. One thing Metro needs to start doing to reduce the crowding on buses is to buy buses that have less seats. The 60-foot bus used on the Orange Line has 62 seats. If the number of seats were reduced to about 30 (common seating arrangement on European buses), then the capacity would increase by about 50%. Ingress and egress would improve by making wider aisles and more space around the second and third doors. There would also create enough room to haul bicycles out of the aisle late at night. The subway cars in New York City have less seats than the subway cars in Los Angeles. There are also much less seats on subways in Japan. People standing take up much less space than if they were sitting. I don’t know if this has been studied, and if it has, what the results were, but I suspect that passenger tolerance of standing decreases as the square of the distance traveled. This is one of the “selling points” of driving one’s own car–you always have a seat. Looking at the map above, its clear that that the main emphasis for service improvement should be along Van Nuys Blvd from the Orange Line to San Fernando Rd where most of the current ridership is along the project corridor. Surprisingly, on page 54 of this Metro screening of alternatives pdf, it states under 4.6.2.1 that although the LRT alternatives are expected to have the highest ridership totals, they would potentially have less user benefits and new riders than the BRT alternatives. The reason is essentially that the LRT only serves the market for those traveling along the Van Nuys corridor, while the BRT can serve those continuing down to Westwood without having to transfer. What’s not mentioned is that potentially a Van Nuys Blvd BRT could have a direct route to the North Hollywood Orange Line station if there is enough passengers to justify adding this service. It also states that the constraints associated with LRT alternatives would have the greatest impact on vehicular travel times. 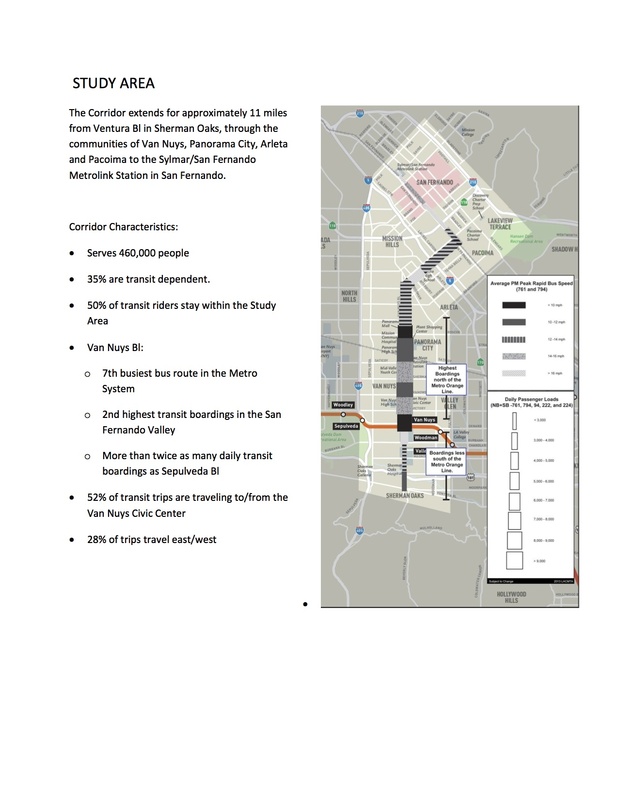 The report indicates on page 57 that BRT alternative would have the most intermodal connectivity to Metrolink, Amtrak, the MOL, Metro Rapid and local bus lines. Cost effectiveness comparisons on page 58 show that the LRT alternatives do not generate a net increase in system wide transit trips over the baseline. If BRT is the way to go, then refund the Valley it’s billions in overpaid transit taxes. If long term benefit, economic growth, and just plain fairness are the ways to go, then we look forward to some rail in North Los Angeles. This was not intended as a rail project under Measure R. It was originally called the East San Fernando Valley Rapidway Improvement Project. The $68 million that was allocated under Measure R was not nearly enough to do either a LRT or BRT project. This amount was increased to $171 million with state funds, but that’s still not nearly enough for LRT, but BRT does become a possibility with that amount of money. A billion dollars was included under Measure R for a Sepulveda pass transit project and there was also millions for the Orange Line extension, along with money for the ESFV transit improvement. That is an old document in which the the Streetcar/Tram was eliminated per Page 7 of the PDF file you provided. Early this year or maybe late last year, Metro brought back the Streetcar/Tram without much explanation as to why a transit mode was eliminated and then brought back from the dead with out any public explanation. The Source certainly didn’t cover that change. Metro’s explanation as to why LRT is not as good as BRT is ridiculous. LRT has been projected at close to 40,000 boardings, many thousands more than BRT; the LRT line would be compatible with a Sepulveda Pass line; and there are grumblings about upgrading the Orange Line. Again a Full subway Metro from San Fernando to LAX along Van Nuys is the only choice. A billion plus was spent to expand the 405 through Sepulveda Pass with almost no improvement now. How will traffic be in a few years? The Orange bus has high ridership in a poor corridor. A heavy rail line in a good corridor will show a even greater draw to the new line. For years I lived in the area of the Van Nuys LA Government Center just off Van Nuys Boulevard where buses and bikes have to fight for space with mixed flow car traffic on a street that is over 150 feet wide in sections. Trust me, I rode on both on Van Nuys. I’ve nearly been hit by speeding cars and angry drivers as I use a piece of the expansive highway sized road and had been late for work numerous times at The Getty because the 761 “Rapid” had traffic delays on Van Nuys (and still more on Ventura during rush hours with no bus lanes or any tangible sense of priority over lone drivers in private cars). For me, it’s hard to believe that no one at the LA Department of Transportation or LA County MTA (Metro, operator of the very buses being delayed) thought to paint a very cheap bus lane and bicycle lanes on this very wide street. Politically given how transit dependent and at points low in volume the traffic the street is for its expansive girth a bus lane some time ago would’ve been a very palatable and very tangible priority of modes that are not private automobiles. In any case, I am supportive of rapid transit on Van Nuys Boulevard, so long as it breaches the largest regional barrier in the San Fernando Valley which is the Santa Monica Mountains to the south toward the LA basin. The Santa Monica Mountains are every bit as much a physical barrier to jobs and relationships as the the San Francisco Bay is to Oakland jobs and relationships in City of San Francisco. Like the poster above says, a Valley-Westside rail tunnel is LA’s SF Transbay Tube, or I’ll say our Manhattan to Brooklyn- and Queens-bound East River crossings because we need more than one (Red Line). Thanks for reading.